He recalled having seen the same 83-year-old woman about three hours earlier at the lift lobby of his Sengkang Housing Board block when he returned home from work. But he also remembered her because of a notification from the Dementia Friends app, which had a picture of the same woman. Her family had sent an alert that the dementia patient had gone missing. Mr Lim, who works as an elder sitter at Filos Community Services where he provides care for dementia patients in their homes, said: "I calmed her down and asked for her address." The senior said she lived on the 18th floor of the same block but could not remember her unit number. Although the pair checked several units on different levels at the block, they could not locate her home. By then, Mr Lim had already responded to the missing person alert on the app. Soon after, her granddaughter called Mr Lim and he took the senior to her family in the same Sengkang block. The correct unit was on the 11th floor. He said: "It's good to help someone in need." The woman was reunited with her family, less than 10 hours after she had wandered off. She usually lives with her children in Yishun but was staying with one of them in Sengkang when she went missing. Her granddaughter, 24, who declined to be named, said her grandmother is growing more forgetful. When she went missing last December, her family searched for her in different places. While on Facebook to rope in more people to look for her, the granddaughter came across the Dementia Friends app - which she now describes as a "really good initiative". The granddaughter said: "We really appreciate Anthony's help, especially since he made the effort to accompany my grandma to look for the unit (home)." Since the free Dementia Friends app was launched in October last year, over 4,100 people have downloaded it, said Dr Amy Khor, Senior Minister of State for Health, in Parliament earlier this month. The app allows families of a missing person with dementia to send an alert, with the missing person's picture, personal particulars and place where he or she was last seen. Users can also report sightings of the person through the app; alert the caregiver if they find the missing person; or accompany the person to over 200 designated Go-To points all over Singapore where staff can assist the dementia patient. The app also gives users information about dementia and help resources. It was developed by the Agency for Integrated Care (AIC), Nanyang Polytechnic and the Integrated Health Information Systems, which runs the information technology systems of all public healthcare institutions here. Over 50 people, aged between 50 and 90, who were reported lost have been assisted so far, thanks to the app. An AIC spokesman said in some instances, the seniors were found through the app or when family members located them. She added that AIC will follow up with the families of the person reported missing to refer them to the relevant help services they may need. 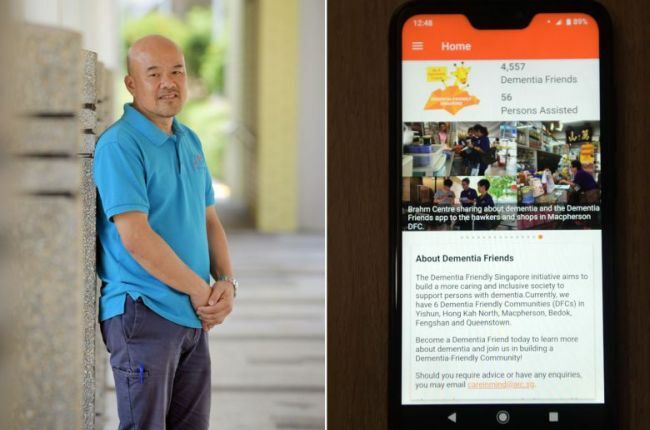 Mr Jason Foo, chief executive of the Alzheimer's Disease Association, said the association has received feedback from some caregivers that the app is useful and informative. Mr Lim said: "It's good for more people to know of the Dementia Friends app so that more will look out for those with dementia." Those interested to learn more about dementia or are a caregiver looking for advice or support can contact careinmind@aic.sg.